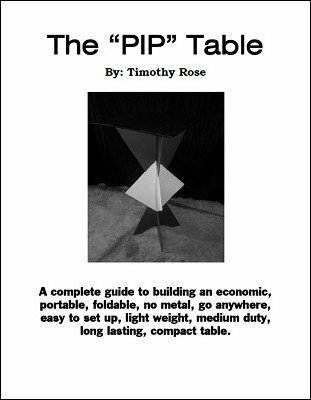 This is a DIY ebook is for building an attractive, light weight, portable and cost effective performance table. Everyone needs a table or ten when doing shows. Many on the market today are just way too much table and way too much money. This ebook is the answer to your table needs. Pip tables are attractive, sturdy for medium duty, fold-able, compact, reliable, easy to build, cost effective, light weight, airline friendly and great for all venues and performing styles/audiences. Build it in a weekend or less and have a great utility for a lifetime. This manual goes through the process of building this creative item. Unlike other building plans, every little dimension is laid out in a blueprint and photos. There is no guess work. Download now and enjoy the knowledge that will last you a lifetime! 1st edition 2015, 20 pages.